When you gain control of Kara, you’ll have to enter the bus terminal and get on the bus towards the US-Canada border. However, the guards there will announce that nobody can get onto the bus without tickets. 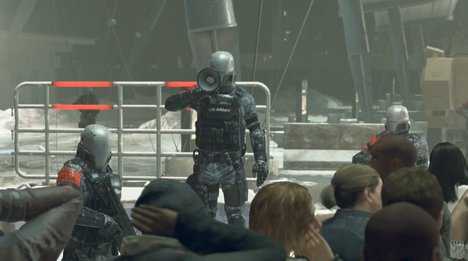 You’ll have to move around the terminal without getting stopped by the guards patrolling the crowd. Keep moving around and avoid the path of the guards and make your way deeper into the crowd. Make your way to forward and to the left, where you’ll find a mother with her baby on a bench (behind a television monitor). Speak to the mother to start a dialogue with her, which will cause her husband to come to get her and drop a bus ticket. Hit the prompt to pick it up. Eventually, the mother and husband will come back looking for the ticket and ask you if you had seen it. You’ll have a choice to return the ticket or keep it. Hit the option to KEEP THE TICKET twice when asked. The two of them will search for it desperately before sitting down. NOTE: You MUST keep the ticket at this point in order to get the Good Ending to the game. If you decide to return the ticket to the mother, you’ll be made to take a path that will eventually kill a character later on and prevent you from earning the best ending. Keep the ticket, otherwise you’ll have to replay this entire section. With the ticket in hand, walk up to the guard infront of the gate and give him the tickets. He’ll let Kara, Alice, and Luthor pass onto the bus. When you get to the bus door, Alice will ask about the couple. Pick the choice to REASSURE and you’ll see a cutscene play out. After the scene from before fades out, things will shift over to Marcus with the rest of the Jericho survivors. When you can move again, you’ll have to walk up to the car and use it to complete the barricade. Hit the prompts to push the car and a short scene will play before you reenter the barricade. Walk around the camp and speak to each of the people inside. You can talk to Simon, Josh, and some of the survivors on the ground. As you move, you can light the garbage cans on fire, which will converge some of the androids together near them. In addition, you can walk up to the flag and plant it on the side of the barricade, which will increase your public opinion. Marcus can also go to the equipment on the ground near the center and post a digital message to the human journalist in the distance, pick a peaceful message to display when you do so and the public opinion will further increase. Next walk over to North and speak to her. 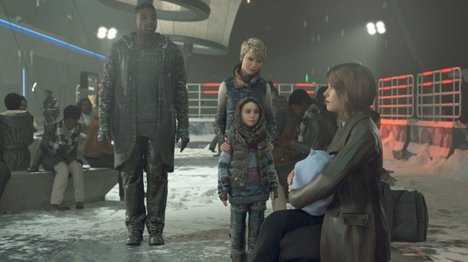 You’ll be given a choice of dialogue when speaking to North, mainly about the other survivors that were lost. When you’re given a second choice, pick the option REGRETS and you’ll see more dialogue between North and Marcus play out. 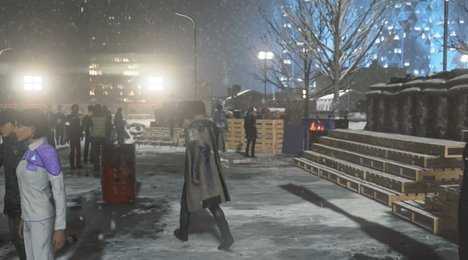 After the conversation finishes, you can walk around some more before North calls you over to the side of the barricade. The FBI agent will show up and call for Marcus to come to meet him. 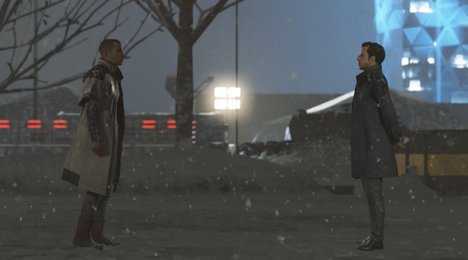 When given the option to meet him or not, choose to ACCEPT his call and Marcus will walk out to talk with him. 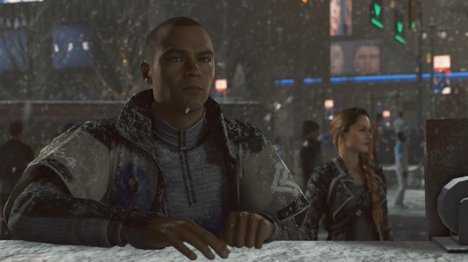 During the conversation here, Marcus will have a few more choices to make, which give options about standing off against the SWAT or surrendering to save his people. Pick the options OTHER DEMONSTRATIONS, NOT AFRAID, and REFUSE DEAL during this conversation. NOTE: If you accept the deal from the FBI Agent, you won’t be able to get the Good Ending. You have to refuse the deal you’re offered, no matter what the FBI agent tells Marcus. After you refuse the deal, Marcus will return back to the barricade and speak to everyone there. A grenade will be thrown and knock him down. After this scene, the perspective then shifts over to Connor back at the CyberLife Tower.